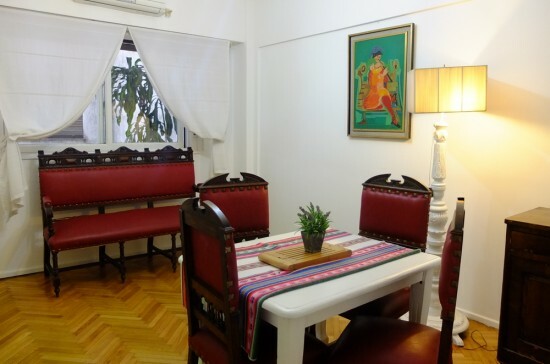 A bright spacious apartment, decorated with light colors and very well furnished. In the main roon, the living/dining room, you will find comfortable, stylish armchairs. The kitchen is equipped with a toaster, microwave, coffee maker, stove and refrigerator. The bedroom, which has a double bed, is always bright with natural light and is very comfortable. The bathroom is small and has a bathtub. Also, there is a balcony that looks over Perú. This apartment is ideal for a couple. If you want authentic atmosphere rather than an antiseptic hotel, then this is what we offer. We had the time of our lives in Leti´s lovely flat in the bubbling neighbourhood San Telmo, with the market, the green grocer, the bakery all on hand. Thank you again Leti!